Session 183. Sunday 17 June 2012. 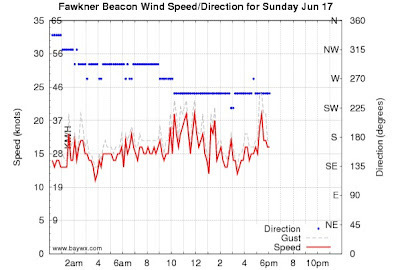 The forecast Westerly wind came in, but it was up and down. A series of squalls came through during the day, with lulls in between. I arrived at Hampton in the early afternoon. Several kites were setup on the beach, with kiters waiting. A squall came through and everyone sprang into action. I had a couple of runs on my surfboard using the Noise 12m, then the wind dropped. I setup the Sector 60 and got going on that for a few runs. I found it a bit tricky to use wearing booties. Eventually, the wind dropped further so I came in and packed up. It may have been better during the morning when the wind was more consistent, but it was nice to get wet again. 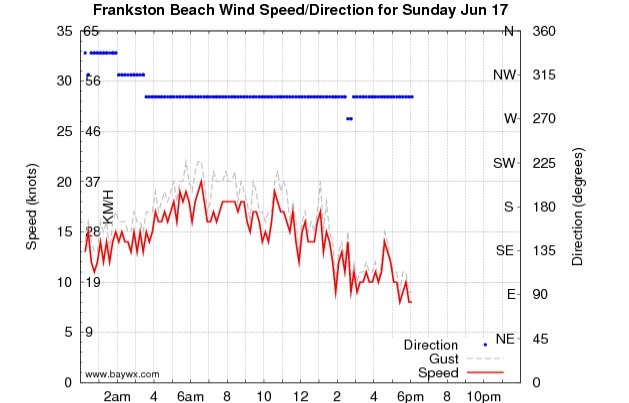 Frankston looked like it was getting stronger wind too. This time of year you have to take what you can get, and some wind is much better than none! At last some good wind! 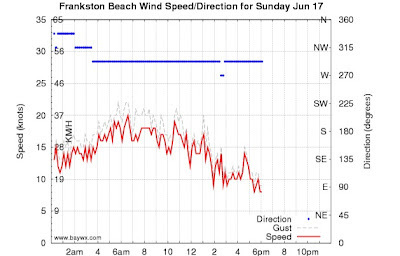 Got down to Frankston around 9:00 with Stuart, Tarren arrived soon after. Nice clean northerly of around 20 knots blowing. I took out my Switchblade 10m and the surfboard (S-Quad). It was SO nice to be on the water. The wind was consistent and the water clear. A reasonable swell made for nice kitesurfing closer to the shore. Toeside riding was going well, even on my weak side (right foot forward). Franz arrived half way through the session and smashed the small swell. I did my first gybe (foot swap) on the surfboard too, prior to turning, which was good to achieve. Stuart broke a front line and swam in - lucky we weren't at Brighton! Two hours on the water was a great session.